A few years ago the Discalced Carmelite Community at Ta’ Xbiex expressed their interest to install a pipe-organ for their relatively modern (post-WWII) church, which is also the Ta’ Xbiex parish church. A new, custom-built pipe-organ was too expensive for the parish so the only option was a good second-hand pipe-organ. During a visit to Germany, Robert Buhagiar got to know about an electro-pneumatic organ which was up for sale. It was built in 1967 by Seifert Orgelbau, one of the best German organbuilding firms. Mr.Buhagiar inspected the organ and was pleased with the technical and tonal performance of the organ. The state of conservation was very good and the internal ‘membranen’ had been replaced only a few years before. Therefore Mr.Buhagiar proposed this organ to the Ta’Xbiex community who decided to buy this organ. Mr.Buhagiar himself directed the dismantling works of the organ in Germany helped by local volunteers. All organ parts were carefully packed and shipped to Malta in a 40ft container which reached Malta in July 2003. The parts were then placed in storage in the priory awaiting the construction of a platform gallery above the main entrance to the church. All organ parts were checked and overhauled as required by Robert Buhagiar. The two modern style cases were erected, followed by the two main windchests, bellows, secondary chests and finally the pipework. The wind is supplied by two silent electric blowers placed in the cases above the pipework. The console was placed at one side of the church and an electric cable connects it to the organ cases. The façade consists of pipes from the Pedal Prinzipal 8’ and the Great Prinzipal 8’. The largest façade pipes are of flamed copper while the rest are of medium percentage tin. 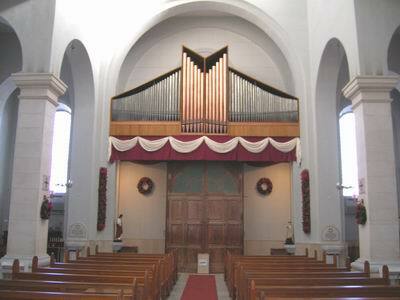 The rebuilt organ fits excellently in the arch above the main entrance such that it seems that the organ was custom-designed for the Ta’ Xbiex parish church. The original voicing was respected. In an attempt to provide some 'warmth', the delicately voiced Gamba 8' was tuned to be a Celeste when played with other soft 8' ranks, though it is also perfectly in tune when played by itself. The performance of the organ is optimal. The response of the key and stop action is excellent. The tonal structure is well planned and the various stops blend well. Though it is a neo-baroque instrument it possesses bold foundation ranks while the upperwork is not too shrill at all. All departments (2 manual and pedal) are ‘complete’ departments with foundations up to mixtures and reeds. 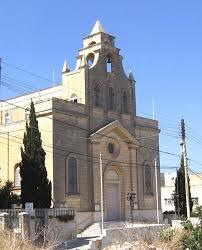 An inauguration recital was held on Thursday 5th January 2006 by Dr.Hugo Agius Muscat. The Discalced Carmelites built a priory and a church in ta' xbiex in 1948 on a plot of land given to them by Baron Pietro Paolo Testaferrata Moroni Viani. The church was opened for worship on 1958 and became the parish church of the locality in 1st June 1969. It was dedicated in 1989.